The Thor movies have consistently been some of my least favorite offerings in the Marvel Cinematic Universe, so I was thrilled when Marvel Studios tapped director Taika Waititi (What We Do in the Shadows) to helm the movie's third offering. After seeing a short film at San Diego Comic Con featuring Thor moping around the house, wondering why the Avengers hadn't called, my excitement tripled: Was it possible Waititi's personal style would be allowed to flourish over Marvel's streamlined, episodic approach to films? For better or worse, Marvel movies have a very distinct flavor: you go in pretty much knowing what you'll get, and that approach largely helps to avoid critic and fan fiascos a la DC's Batman v. Superman. It also means you're less likely to walk out of the movie feeling like you've seen something innovative or surprising. Thor: Ragnarok doesn't really break that mold; instead, it's all about the little things. It feels like Waititi was working with a bland outline for the film and character arcs, but filled in the outline with wild visuals, sharp dialogue, and some of the best casting I've ever seen. The film opens with Thor having visions of the destruction of his home world, Asgard. He returns to it and finds Loki and, eventually, his father Odin, to warn them of the threat and work to prevent it, but the threat materializes anyway in the form of Hela (Cate Blanchett), the goddess of death. The conflict, villain, and goal all materialize in the film's first 15-20 minutes, but Thor gets sidetracked after being stranded in a place known as Sakaar, which triggers a chain of events that ultimately results in Jeff Goldblum (playing the Grandmaster, but also really playing Jeff Goldblum) forcing Thor to fight The Hulk in a gladiator-style battle. I think in the hands of many other filmmakers, Thor: Ragnarok could have been a joyless mess. The screenplay had several people working on it and even sparked disagreements about who would receive writing credit. Ultimately, though, the finished product feels like a tedious story that was greatly enhanced through on-set improvisation. We know Thor: Ragnarok has to be a somewhat self-contained story, but the result feels almost like a series of fetch-quests: Thor has to go here, and then there, find this, talk to that person, escape this place, get to that place. Bump after bump creates a series of small scale conflicts for Thor to overcome, and about mid-way through the film, this approach really takes its toll. The most interesting parts of the film were already revealed well ahead of time in multiple previews, so the long series of events and buildup that will eventually place Thor and The Hulk in an arena together are made all the more tedious: we know it's coming, just give us the fight already! That little bit of magic sparkle Waititi adds via casting and dialogue really helps to save the proceedings, though. Blanchett is an absolutely stunning, devastating villain - surely one of the best Marvel has produced in a long while. Every single minute of Goldblum's screen time is sheer joy and delight. Tessa Thompson plays Valkyrie as the Han Solo of the movie, and she shines as one of the most memorable and well-developed companions Thor has had thus far. Thor: Ragnarok is also genuinely funny when it's not caught up in conflict (there are even a few interesting cameos to kick things off). 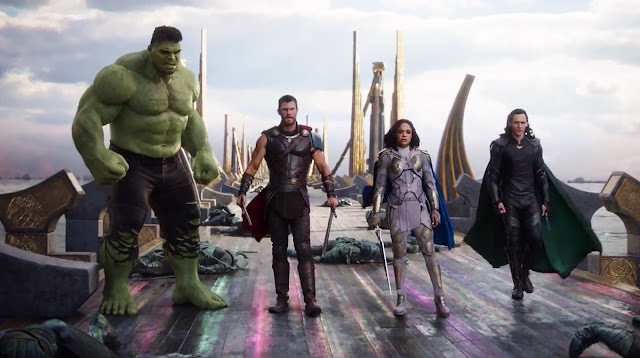 And beyond all of the interesting characters that are added to Thor's universe in this go-around, the entire look of the film is gorgeous: bright, neon, over the top colors and costumes as far as the eye can see. It's also worth mentioning that the tone Chris Hemsworth strikes as Thor in this film is probably the best they've ever done with this character on screen. He still has just the right balance of arrogance and self-doubt, but the character no longer needs fish-out-of-water jokes to be funny. Overall, the skeleton of Thor: Ragnarok is slight at best and completely meandering at worst. But the way the cast, dialogue, and visuals have filled in that outline make the film one of the best in Marvel's lineup and far and away the best Thor movie thus far.